Labor and community groups are gearing up to defeat a measure that is on the November ballot in California aimed at crippling the ability of unions to financially support election campaigns. Proposition 32, put on the ballot by wealthy conservative corporate leaders, claims it will stop “special interest” groups from funding politics. Yet, Prop 32 targets only unions, and not corporations. Proposition 32 sounds fair on the surface. It calls for prohibiting corporations andunions from deducting money from workers’ income for political campaigns. But only unions deduct money from its members’ income, in the form of union dues, which is the only source of income for most unions. A small portion of union dues are donated to political campaigns. Corporations don’t raise money by deducting money from their employees’ pay, so Proposition 32 has no impact on corporations. Backers of Proposition 32 are deceptively trying to play on the public’s anger over real special interest money flooding into election campaigns, money that comes primarily from corporate sources. Today, corporations, unions and anyone else can give unlimited amounts of money to political campaigns and do it anonymously, thanks to the 2010 Supreme Court decision in Citizens United. The AFL-CIO has come out strongly against Citizens United — as has President Obama — and has called for fair election financing. One high profile recent example of how corporate money corrupts politics was the recall election in Wisconsin of Scott Walker, the Tea Party Republican Governor. Walker gained notoriety by ramming a bill through the Republican-dominated Wisconsin Legislature in early 2011 that stripped bargaining rights from unionized public workers, sparking a firestorm of worker and community protests and a petition for his recall. In the 2012 recall election, Walker raised $30.5 million, most of it from corporate sources. His Democratic opponent, Tom Barrett, raised $3.9 million, much of it from working people through their unions. Walker outspent Barrett almost 8-1, and won 53% to 46%. The right-wing corporate forces that control the Republican Party want to duplicate this huge discrepancy in political spending in every race in the country. As of early August 2012, the top five contributors to Republicans — all conservatives from corporations — gave $75 million. The top five contributors to Democrats — all moderates or liberals from corporations — gave $12 million. A handfull of billionaires want to buy elections to put their political representatives in office. 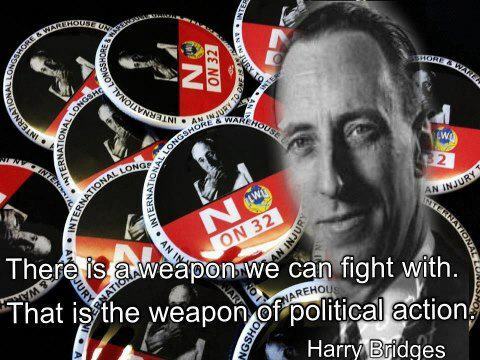 Their goal is to silence the 99.9%, so theirs will be the only voice heard in elections and politics. designed to weaken workers and unions and give corporate CEOs even more power to boost their profits by cutting jobs, eliminating retirement security and reducing wages. The ILWU doesn’t fight just for its own members. It, and all other unions, fight for everyone. For more than 75 years, unions have been the driving force in passing and protecting our most important social programs, including Social Security, Medicare, unemployment insurance, funding for public schools and health care, and many others. Unions are the last line of defense for the 99%. A chief proponent of Proposition 32 (and Citizens United) is the Lincoln Club of Orange County, a right-wing business organization that began in the early 1960’s promoting Richard Nixon and Ronald Reagan. The Lincoln Club was founded by the heads of Fluor Corporation, a Fortune 500 construction company; Beckman Instruments, maker of lab equipment; and Knotts Berry Farm, a multi-million dollar amusement park. Current Lincoln Club president, Robert Loewen, is a corporate lawyer for Gibson, Dunn and Crutcher, whose major clients include Merrill Lynch, the corrupt financial investment firm that helped crash the economy in 2008, and then was absorbed by Bank of American with bailout money from taxpayers. 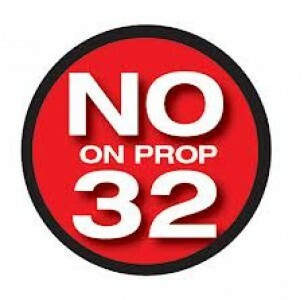 Lincoln Club chair emeritus Michael Capaldi continues to spread the lie about Proposition 32, saying it will “deal a blow to corporate and union power together.” This false message is flooding the airways now in our state. If Prop. 32 passes in California it will spread across the country. The labor movement, Democratic Party, and a host of community allies are fighting back, speaking at events, meeting with co-workers and neighbors, precinct-walking, phone-banking, distributing flyers, bringing the NO on 32 message to big public gatherings like the recent Labor Day Parade in Los Angeles, and running ads of their own to tell the truth about Proposition 32.